A new Hunter card from The Boomsday Project has been revealed, and it continues to add to the Mech theme of the expansion. The Boomsday Project expansion is less than two weeks away, and cards are being unveiled over the next week ahead of the set's release. 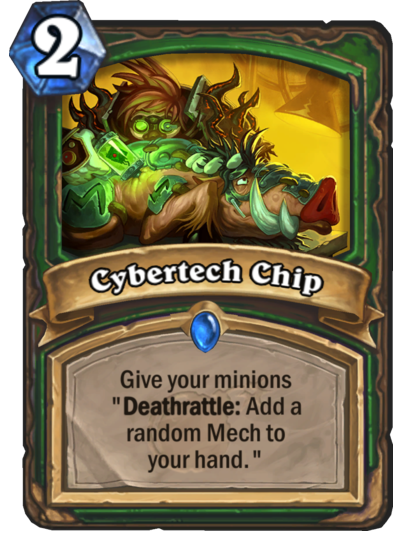 Cybertech Chip is a two mana Hunter spell. It gives all of your minions a Deathrattle to add a random Mech to your hand. Immediate parallels were drawn between this card and Infest, though this card costs one less mana. One reason why Infest never took off was the huge disparity in cards that could come from the Deathrattle. Mechs have a much smaller pool right now—so maybe once we've seen everything this expansion has to offer, the odds of getting a good card to play will be high enough.